Seed potato growers in the tribal Lahaul valley are looking for new markets in the North-East in the wake of a bumper crop in the state. The Himachal Medical Officer Association (HMOA) has demanded that the pay ceiling of the doctors in this hill state should be increased to Rs 85,000 from Rs 79,000 as had been done in the neighbouring state of Punjab. The 20,000 kg of soil reportedly brought from Tibet mesmerised Tibetan exiles here as they touched, walked over it and applied it to their foreheads at the upper Tibetan Children Village (TCV) playground, where it was spread yesterday. Tibetans living in exile here today carried out a candlelight march from Norbulinga to the Gyuto monastery as a symbolic protest against self-immolation. The Congress has lambasted the BJP government over the seizure of drugs worth crores of rupees manufactured illegally from a pharmaceutical unit in Baddi by the Directorate of Revenue Intelligence and said it reflected the all-round decline in the quality of governance in the state. The GOC, Star Corps, Lt Gen AK Choudhary, paid homage to martyrs by laying a wreath at the War Memorial at Yol Fort to mark the Infantry Day today. MP and president of the Himachal Pradesh Cricket Association Anurag Thakur today urged the residents of the state capital to extend their whole-hearted support in getting the Annandale ground back from the Army so that a stadium of international level could be set up here. Tilak Raj Sharma, former MLA from the Bilaspur Sadar constituency and now district Congress Sewa Dal in charge here, has criticised what he said was the unsystematic functioning of the Transport Department. He has demanded suitable steps be taken to set the department in order so that there are no more accidents like the one two days ago when 27 persons died and 20 others were crippled in a bus accident from two gram panchayats of Sidha and Bandla near here. Expressing dissatisfaction over the functioning of the state authorities, the high court has stated that despite the availability of two legislations - the Himachal Pradesh Roadside Land Control Act, 1968, and the Himachal Pradesh Road Infrastructure Protection Act, 2002 - there is hardly any space for development of roads on either side due to lack of proper enforcement. Chief Minister Prem Kumar Dhumal celebrated Diwali with inmates of the Sarvodaya Bal Ashram, near Kamla Nehru Hospital, and the Bal Ashram at Tutikandi, yesterday. Joint inspection teams of the Wildlife and Animal Husbandry departments have started touring the state to identify the sites for setting up 21 new monkey sterilisation centres to achieve a target of sterilising two lakh simians by June 2012. The Jawali police today arrested Manu Sharma, a local resident, for allegedly impersonating as Neeraj Bharti, Congress MLA from the Guler Assembly segment, against whom the latter had lodged a complaint with the police on May 5 last. The total production of seed potato has shot up from last year’s 1.50 lakh bags (80 kg each) to 2.30 lakh bags this season. Interestingly, the output has increased despite a 20 per cent decline in the area under the crop in the Lahaul valley compared to last year. With the market situation not very encouraging, the Lahaul Potato Growers Society (LPGS) is looking for new buyers in far-off states like Assam and Meghalaya. Last year, it sold some consignments to Tripura. This year, West Bengal is also keen on making bulk purchase, but it will all depend on the price offered. Director of Agriculture JC Rana said the prices would firm up after the sowing season started from mid-November onwards in various states. The department also procures its requirement of seed potato from the LPGS for which a meeting of the negotiation committee will be held on November 15. Last year, the price quoted by the LPGS was Rs 1,440 per quintal. Rana expressed the hope that with table potato selling at Rs 12 per kg, the seed potato should fetch a good price despite the bumper crop. He said all produce had been transported out form the valley to Manali and grading of seeds was on. Managing director of the society Amar Chand Dogra said the production would have been higher but for the reduction in area under seed potato due to a large number of growers switching over to vegetables like peas, broccoli, cabbage, cauliflower and other cash crops, which were fetching good returns. They were discouraged due to the poor seed potato crop during the past two years. In 2010 humid conditions due to cloudy weather and rain affected production, while in the preceding year, dry weather hit production. The temperate agro-climatic conditions make the state ideal for the production of disease-free seed potato and as a result it has dominated the country’s market for about four decades. Farmers from across the country, including far-off states like Karnataka, Kerala, Gujarat, Maharashtra and West Bengal, procure their requirement from the state. However, the new seed plot technique developed by the Central Potato Research Institute, which made it possible to grow virus-free seed potato in the plains, has ended the state’s monopoly. The area under seed potato has been dwindling and it has come down from 1,500 hectares to about 600 hectares. Demanding this in a statement here today, Dr Susheel Sharma, state press secretary, HMOA, said post-graduate (PG) degree-holder doctors should be given Rs 15,000 and diploma holders Rs 12,000. He said the existing incumbent RKS doctors should be brought within the purview of appointments by regular contract with their seniority intact. He demanded that the medical officers who had completed three years’ contract or RKS services should be brought under the regular cadre. Besides, the recently appointed regular doctors through the HP Public Service Commission should be given service benefit for PG entrance and financial benefits. The HMOA demanded the immediate release of grants of four-tier pay scale (modified assured carrier progression) to all the HPHS doctors as per the Punjab pattern notified by the Punjab Government on July 22 this year. The HMOA further demanded that the BMOs appointed recently on ad hoc basis should be regularised immediately. Dr Susheel Sharma said under the Food and Safety Regularity Act, the BMOs should be appointed as the Assistant Licence Authority as people were facing difficulties while making food licences as they had to travel 100 km to reach district headquarters for this purpose. HAS officers should be removed from the Directorate of the Health Services and senior doctors should be posted in their place as the administrative officers were allegedly neither experienced nor well versed with the health problems, said Dr Sharma. The HMOA said the District Programme Officer’s posts should be made promotional posts and senior-most BMOs should get these. Medicos demanded that there should be over all restructuring of the cadre and a post of the DGHS should be created and four posts of the Joint Director should be redesigned as Directors. Sharma said telephonic allowances should be given to all the doctors. The HMOA demanded that the government should fill up all the super-specialty seats in DM and MCH on the basis of the 50:50 basis by GDOs and direct candidates. However, US-based Tibetan artist Tenzin Rigdol and the other organisers of the event kept the source of the soil a closely guarded secret. Rigdol, when asked about the source of the soil, which he claims to be from Tibet, dextrously avoided answering the query. Sources, however, said Tenzin Rigdol was producing a documentary in which he would reveal the secret of how such a huge quantity of soil was brought from Tibet. Some of the organisers, speaking on condition of anonymity, said they were not revealing the secret to avoid a controversy. The event began after the soil from Tibet was spread on the open grounds of the upper TCV at McLeodganj. A portrait of the Dalai Lama was placed in the centre and the Tibetan national flag was raised on the soil from Tibet. While the young walked over it, old men, who had travelled to India in 1959 with the Dalai Lama, kneeled down to touch their foreheads on the soil. The monks recited prayers and threw a handful of soil to the sky as offerings. Inaugurating the event titled “Our Land, Our People”, an emotional Tibetan Prime Minister-in-exile (Kalon Tripa), Lobsang Sangay, said it had been the dream of many Tibetans to return to Tibet and set foot on Tibetan soil. Many had passed away with that wish unfulfilled. “Today, I am stepping on this soil as a gesture of our struggle to reunite with our brothers and sisters in Tibet,” he said. Speaking about his work, Tenzin Rigdol said his father, who died as a refugee in 2008, was the inspiration behind the project. Rigdol also presented a tray of soil with “Bhod” meaning Tibet in Tibetan script to the Dalai Lama. Later, addressing a press conference, Rigdol said he felt honoured at being given an opportunity to present a tray full of soil to the Dalai Lama. “I feel very happy and honoured with the experience,” he said. Organisers said the installation would go on till Friday after which the soil would be given away as souvenir. 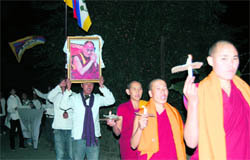 Tibetans living in exile here today carried out a candlelight march from Norbulinga to the Gyuto monastery as a symbolic protest against self-immolation by yet another Tibetan monk in Tibet. The Tibetans claimed that Dawa Tsering, a 38-year-old monk from the Kardze monastery in eastern Tibet, immolated himself on October 25. He is the 10th Tibetan monk to have committed self-immolation in Tibet this year. The Tibetans participating in the protest march claimed that the continuing cases of self-immolation by Tibetan monks in Tibet illustrated that people were losing their patience due to a crackdown by China on Tibetan religious practices and way of living. The cases of self-immolation were the result of a “forcible re-education scheme” launched by the Chinese government to eradicate the old Tibetan culture, they maintained. The protest march today was organised by the Regional Tibetan Youth Congress (RTYC), led by Tibetan activist Tenzin Tsundue. The Tibetans have stepped up their protests and activities against China after the recent news regarding self-immolation by monks inside Tibet started coming. The Chinese authorities have criticised the Dalai Lama for not openly condemning the self-immolation that, they claim, are against the tenants of Buddhist religion. Meanwhile, Hollywood actor and strong Tibet supporter Richard Gere, who was here yesterday, asked Tibetans to be strong and united in its struggle for a free Tibet. He said keeping the Tibetan community united was of paramount importance in the face of repressive Chinese policies in Tibet and hardships in exile. The hearts of the Tibetan people have remained unchanged. The three generations of Tibetans have done very well, especially in education and health, Gere reportedly said while addressing members of the Central Tibetan Administration (CTA). 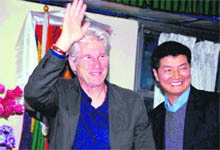 Tibetan Prime Minister-in-exile Lobsang Sangay described Gere as a tested friend of Tibet. Gere kept away from the media during his short trip to Dharamsala. He also met his spiritual guru, the Dalai Lama, sources said. General secretary of the party Kuldeep Rathore said it was shocking that state government agencies had no idea about the illegal manufacturing of drugs in Baddi even though the Health Minister belonged to Solan district of which Baddi was a part. Central agencies had raided the unit following leads from Mumbai. The involvement of high-ups in the scandal could not be ruled out as the illegal drugs were being supplied to the Punjab government, where the SAD-BJP alliance was in power, and sold in various parts of the country. He said the BJP government had been exposed earlier too when the drug controller, who was booked on a charge of corruption, was re-instated and the court convicted him later. The increase in illegal activities was a result of the indiscriminate grant of permission under Section 118 of the Land Reforms and Tenancy Act to outsiders to acquire land in the state. Permissions were being granted to all sorts of people on one pretext or the other without checking the background and it would have huge implications for law and order in the state. It was high time that the government reviewed the background of those who had acquired land in the state under Section 118 and took necessary corrective steps. Rathore said it was surprising that the government agencies could not detect such large-scale unauthorised manufacturing of drugs, including psychotropic formulations, in the heart of a main industrial hub of the state Referring to the ongoing elections of the Youth Congress, he said the policy was that the party would not interfere in the process and he expressed the hope that senior party leaders would adhere to the policy. Speaking on the occasion, Lt General Choudhary said on this day 64 years ago (Oct 27, 1948), in response to the first threat to the sovereignty and territorial integrity of the nation, troops of the Indian Infantry landed in Srinagar and resolutely defended the Kashmir valley from falling into the enemy hands. Homage was paid to the grit, courage and sacrifice of the Indian Infantry soldier on this day, he said. Thakur, who today laid the foundation stone a cricket academy to be set up in Lalpani here, said the setting up of an international-level stadium would help give a major fillip to tourism and bring the “Queen of Hills” on the global scenario. “I assure that within two years of the handing over of the Annandale ground, we will set up a stadium for cricket and all other games so that the people of the state can avail of the best and latest sports facilities,” he said. Lauding the efforts of the District Shimla Cricket Association in launching a signature campaign to get back the Annandale ground from the Army, he said the residents of the state capital must launch a movement to get the possession of the ground. Thakur said the cricket academy being set at Lalpani would be ready by April next year and would emerge as the main centre with facilities for all sports. “This will have provision for two indoor and three outdoor wickets which will not hamper the practice of players during monsoons and winters,” he said. Local MLA Suresh Bhardwaj assured the MP that the residents of the town would provide full support and backing for getting the possession of the Annandale ground so that an international-class stadium could be built. He appreciated the Chief Minister’s gesture of declaring that one ward of each dead family would be given employment, but said this concession should also be given to all families involved in the accident as they were very poor families. Sharma said the government should order the completion of the much-awaited building of the trauma centre which had been under construction for the past several years. He said had this centre been functional, several lives could be saved. Though the Acts were meant to prevent haphazard and substandard development along scheduled roads and to check the misuse of roads, people were generally not aware of their duty regarding leaving a sufficient margin for the development of roads. The court said it was appropriate that some safeguards were made in larger public interest with regard to the maintenance, protection and improvement of roads. The high court directed that there shall not be any construction on either side of any motorable road without obtaining clearance from the Assistant Engineer of the PWD subdivision concerned. The restriction with regard to prior permission shall be applicable to government as well as private buildings. A Division Bench comprising Chief Justice Kurian Joseph and Justice Sanjay Karol passed these directions on a petition filed by advocate Tarlok Chauhan on the tardy progress of works under the JNNURM. The court also directed the PWD to keep in mind the possibility of the development of a motorable road on either side while processing the request for construction on the roadside and to take a final decision on the application for permission within 45 days. The court also directed the PWD to ensure that there was no construction on the actual width meant for the road in any place. The court also directed the Principal Secretary, PWD, to make a preliminary proposal with regard to the Sanjauli-Dhalli tunnel for widening the existing one or the construction of a new tunnel using JNNURM funds within three weeks. The court also directed the Superintending Engineer, PWD, Shimla, to be present before the court on next Monday. The Chief Minister distributed sweets and fruits to children and staff and wished them on the occasion of the festival of lights. He said Indian culture was very rich and diverse in all respects and people the world over were also associating with such festivities. Dhumal said the state government was committed towards the speedy upliftment of the weaker sections of the society, especially children who were orphans or from a economically weak background. “It is the joint responsibility of each one of us to help such children lead a reasonably comfortable life by providing them ample opportunities to become economically self-dependant by helping them acquire education,” he said. He directed the authorities to provide computer education facilities at the Sarvodaya Bal Ashram and woollen sweaters to all the children staying in both the ashrams before winter. Besides the four monkey sterilisation centres that are at present functioning at Tutikandi in Shimla, Sastar in Hamirpur, Gopalpur in Kangra and one in Una, the Cabinet, at its last meeting, decided to set up 21 new centres so that people could get respite from the monkey menace. The government has set a target of sterilising two lakh monkeys by June 2012. Till now only 36,000 of these have been operated upon. “The teams are undertaking field surveys to assess the existing infrastructure to convert the identified spots into proper monkey sterilisation centres,” said AK Gulati, Principal Chief Conservator of Forests (Wildlife). He said the Animal Husbandry Department had provided a list of the sites where the centres could be opened, but it would be only after the Wildlife Department had complete details about building, monkey population and the number already sterilised that the 21 sites would be finalised. He added the doctors to be posted in these centres were already being provided training at the existing four centres. Keeping in view the fact that there is negligible simian population in two tribal districts of Kinnaur and Lahaul and Spiti, no centre would be opened in these areas. The one likely to be set up around Rampur could help cover the adjoining area in Kinnaur. The Forest Department will require a huge amount of funds, about Rs 80 lakh per sterilisation centre, for making these operational. According to the last monkey census done in June 2005, there are almost 3.17 lakh monkeys in Himachal. This year the progress as far as monkey sterilisation is concerned has been rather slow. One of the reasons for this has also been the problem in getting monkey catchers from Haryana, Saharanpur and Rajasthan. The enhancement in the money being given to them from Rs 350 to Rs 500 is also likely to help in the sterilisation work getting expedited. The monkey menace issue has assumed so much significance in the state that during the Assembly poll, it had emerged as one of the major issues and people had demanded that major political parties include it in their manifesto. In many parts of the state, people have stopped planting maize and vegetables as monkeys devastate the crops completely. It is alleged that the accused had threatened the District Ayurvedic Officer, Chamba, Satish Sharma on his mobile in connection with the transfer of a department employee. Dr Sharma contacted the MLA and came to know that someone had impersonated Neeraj Bharti. Confirming this, DSP, Jawali, BS Negi said following investigations the accused was arrested. He said a case under Section 419, IPC, had been lodged against him. Meanwhile, the accused has also been bailed out as the offence was bailable. The accused was once a Congress activist and supporter of the MLA.